The van is perfect for family holidays, it is spacious and easy to tow on the road. 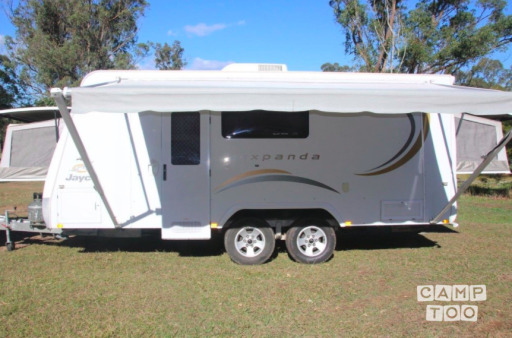 This caravan has a queen size bed and a double size bed which both expand from the ends. The large comfortable Club Lounge can also be made into a bed. This van can sleep 5 to 6 people. Has a combined toilet/shower inside. 150 Litre Fridge and Freezer unit which runs on 240 volt as well as gas. There is a hot water system that runs on 240 volt and gas. There is plenty of storage space and a easy to work in kitchen with a long bench. Everything you need for cooking is included in the kitchen. 100 amp Battery which runs lights, stereo and TV if you are camping without power. A solar panel on the roof charges the battery. There is also a battery monitor to check the battery level. 12 volt cigarette lighter socket so you can charge your mobile phone and other devices. A USB socket also to charge any devices using your USB Lead. The only thing that you need to bring is your bedding, food and clothes. The van has an awning but a fully enclosed annexe is also available as an extra. Outside is also a pull out BBQ which is only available for use if you do not have the annexe. Tap is also installed outside on the drawbar. Your tow vehicle must have a towing capacity of 2500 kg and an electric brake controller. If you don't have a brake controller fitted into your vehicle we can supply a portable brake controller as an extra. For questions please contact us. Your tow vehicle must have a towing capacity of 2500 kg and an electric brake controller. If you don't have a brake controller fitted into your vehicle we can supply a portable brake controller as an extra.